The intersection of income inequality and education is one of the more troubling features of the U.S. economy. Research by Stanford University economist Sean Reardon shows a rising educational achievement gap between students from high-income backgrounds and those whose parents are lower-income earners. There’s plenty of evidence that policymakers should be paying attention to educational differences by income, but most of the data that researchers use to evaluate educational programs don’t directly measure income. Instead, they employ proxies, most often eligibility for subsidized school lunches, to determine the economic disadvantages faced by some schoolchildren compared to others. Simply using current eligibility or non-eligibility for subsidized lunches, however, might not be the best way to look at the effects of income inequality on educational achievement. A new paper by economists Katherine Michelmore of Syracuse University and Susan Dynarski of the University of Michigan shows why. The two researchers use administrative data from the state of Michigan to look at how economic disadvantages affect standardized test scores. Many studies on this question will look at the achievement gap during a single year and use a measure of disadvantage such as being eligible for subsidized school lunches. But the administrative data Michelmore and Dynarski use lets them track students over time to discern how often students were eligible for school lunches mapped to their test scores. Why is there such a difference between students who are occasionally eligible for subsidized lunches and those who are persistently eligible? One possibility is that exposure year after year to low-income living adds up over time, pushing down test scores in the process. 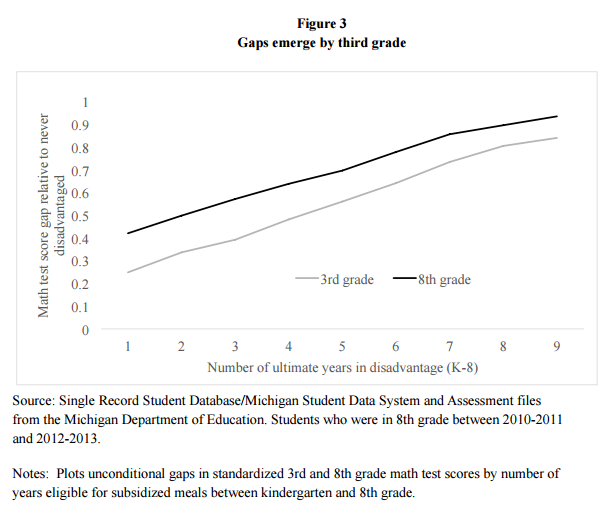 But Michelmore and Dynarski find that the vast majority of the gap between persistently eligible students is present early on in their schooling—3rdgrade, to be precise—so the differences in exposure alone can’t explain the gap. Instead, the two researchers argue that the difference between persistently-eligible students and occasionally-eligible students is a sign that the former are from much lower-income backgrounds. It’s a story of income inequality, not income volatility. These results, as the authors note, have important implications for the design and evaluation of education programs. Eligibility for subsidized lunches is an important metric in many datasets used by researchers and policymakers to compare students across income levels. The difference between students who are occasionally eligible for school lunches and those who persistently may have significant effects. Many federal, state and local education programs use the percent of students in a school eligible for subsidized lunches as a way of targeting school spending. Yet there’s a significant amount of variation among schools with the same amount of eligibility when it comes to persistently and occasionally eligible students. A more targeted program would want to consider this variation as well. A similar dynamic potentially holds for so-called value-added models for evaluating teachers. Often these measures will use the share of subsided lunch eligible students in a classroom as a control for the economic disadvantage of students in classrooms in order to not give lower scores to teachers who have low-income students. But if persistently eligible students are concentrated in some classrooms but not in others, then it could bias these measures of teacher performance. The extent of that bias hasn’t been investigated yet. But what is clear from this paper is the need to use more fine-grained data when thinking about the impact of differences in income on educational outcomes. Other administrative data, for example tax data (if properly used), could be quite helpful. If policymakers are going to implement programs and evaluate them, we might as well use the best tools possible.